The Hall of Fame game between the Arizona Cardinals and the Dallas Cowboys has come and gone, and the dust has settled over the first game of the 2017 NFL preseason. Quarterback play was the talk of the first half while penalties and defense dominated the rest of the way. 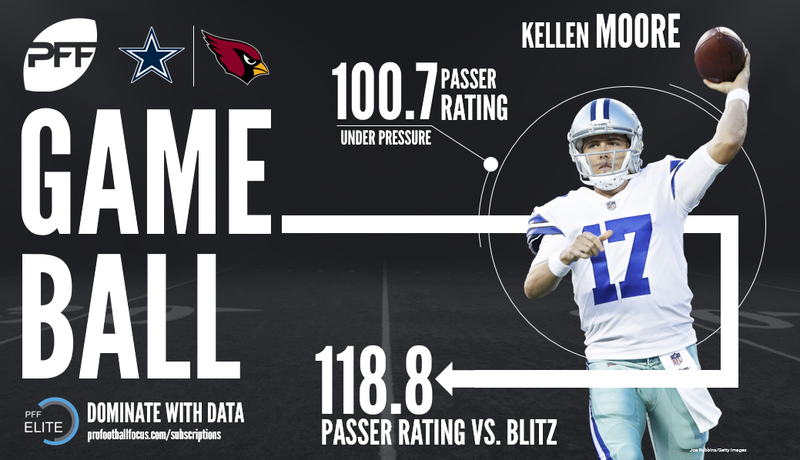 After missing all of last season with a broken ankle, Kellen Moore returned to the NFL’s first action this season with a strong showing. Moore completed over 70 percent of his passes and hit WRs Brice Butler and Andy Jones on two “go” routes against man coverage for 32 and 20 yards, respectively. He also had a well-placed throw to Rico Gathers on a crossing route in the front corner of the end zone. Whether in a clean pocket (passer rating of 108.1) or under pressure (passer rating of 100.7), Moore performed well and moved the ball for the Dallas offense. Former Baylor basketball player Rico Gathers showed he can cut it on the gridiron as well. 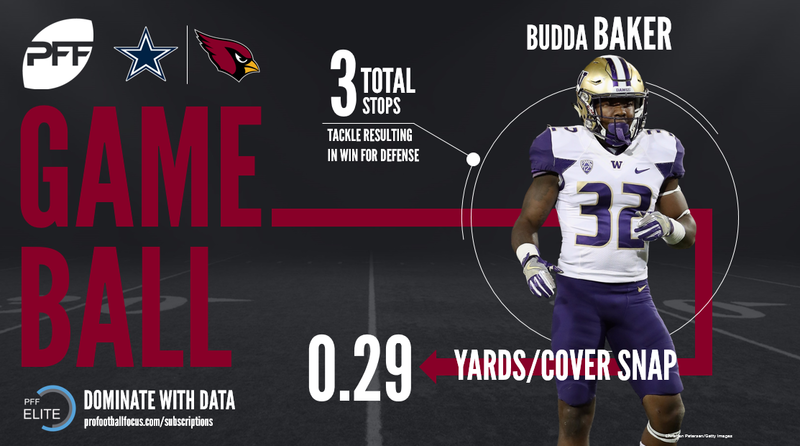 The sixth-round pick did not play one down in college but his long frame and athleticism was on display against the Cardinals’ linebackers as he caught all three of his targets for 59 yards and a touchdown. Gathers held his own blocking as well, posting a solid 78.1 run-blocking grade, something that the Cowboys likely view as icing on the cake at this point in his football career. The Cowboys need to get more production off the edge, and they got a solid night from starters Moore and Charlton. Charlton did not record a tackle or pressure, but did an excellent job of using his length to set the edge and control blockers against the run (80.7 run-defense grade). Moore posted a quarterback hurry and a run stop, while also racking up four assists on just 13 total run plays (80.6 run defense grade). Jones was the top tackler for Dallas, as he posted seven solo tackles and one assist. Four of his tackles were run stops, as he also led the Cowboys in this capacity and posted a game-high run-defense grade of 86.3. While Dallas as a whole averaged just 3.4 yards a carry and broke four tackles all night, veteran Alfred Morris gained 42 yards on seven carries, including 24 yards after contact for an elusive rating of 98.0. The Cowboys’ offensive line was very sturdy in pass protection all night, allowing zero sacks, three quarterback hits (none in the first half), and just five hurries on 36 passing plays for a pass-blocking efficiency of 83.3. Dallas fifth-year receiver Brice Butler continued his strong showing on deep passes in the preseason opener, catching both of his catchable targets over 20 yards downfield for 78 yards. He caught four of nine such targets a year ago, including two touchdowns. Outside of his final play, Gabbert had an excellent first-half performance for the Cardinals. He did the bulk of his damage between the numbers, as he completed 11-of-13 throws to the middle of the field, including going a perfect 8-for-8 for 171 yards on throws that traveled at least 10 yards in the air. He did leave the game on a sour note, however, as he threw an out cut woefully behind his target on the last throw of the half, and was lucky to see the ball fall incomplete. Momah was the top receiving threat for the Cardinals tonight, as he snagged three balls for 48 yards, including 11 yards after the catch. He also performed well as a run-blocker, as he was the only Cardinal tight end to grade above average in this capacity. He had a fourth reception taken off the board for an offensive interference penalty on which he got too physical with the defender coming out of his break. The Cardinals got an outstanding performance from second-round pick Baker. In the first NFL action of his career, Baker’s overall grade of 89.3 was the highest on the night. Baker’s superior athleticism was evident on the field as he few to the ball to post three stops that resulted in an offensive failure and added in a pass breakup while working out of the slot. The Cardinals 2016 first-round pick was dominant in his 23 defensive snaps . He created penetration into the backfield in as a run defender, using his quickness to shoot gaps and re-direct the Cowboy running backs. He added one pressure and finished with a 75.8 pass-rush grade. In addition to Gabbert’s assault on the middle of the field, the veteran QB sported a game-high 92.9 adjusted completion percentage on his throws. He also connected on 5-of-5 passes on play action for 93 yards. Second-year Arizona cornerback Brandon Williams had an up-and-down night, committing as many penalties (two) tonight as he did in 240 snaps a season ago. He also gave up a 32-yard reception before rebounding with an interception in the end zone before exiting the game. In all, Williams saw the game’s lowest passer rating when targeted, as Cowboys signal-callers fielded a 34.7 passer rating against Williams. Cardinals’ undrafted rookie safety Ironhead Gallon has a similarly uneven night in his debut, leading the team with five stops in 50 snaps, while at the same time surrendering a perfect passer rating on four passes into his coverage.